Owosso Speedway would like to welcome Chris Begg as the New Head Tech. Chris brings many years of racing knowledge along with mechanical experience. 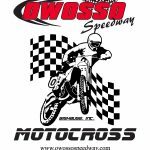 Owosso Speedway Motocross Grand Opening! _Owosso Speedway Motocross Grand Opening!!! This Saturday May 19th !!! Open riding practice, Motorcycle and Quads welcome. Pit gate opens and practice begins at 1:00 and runs until sundown!! Bike and rider pit passes are $30.00, spectator pit passes $15.00. Only spectators kids 12 and under are free. 12 and under that will be riding on the track $30.00. The grandstands will not be opening, everyone will come through the pit gate. Thank you!